Florence County utilized a Recreational Trails Program grant to develop a walkway system that climbs up beautiful Keyes Peak Ski Hill. A concrete path leads to a series of wooden steps that was designed by Florence County Recreation Coordinator Mat Gummin. The Florence County Parks crew spent the fall building these steps. Your treat for reaching the top of the hill, is the picturesque view! You will see Keyes Lake, the Ski Lodge, and surrounding hardwood forest – all which are simply breathtaking! 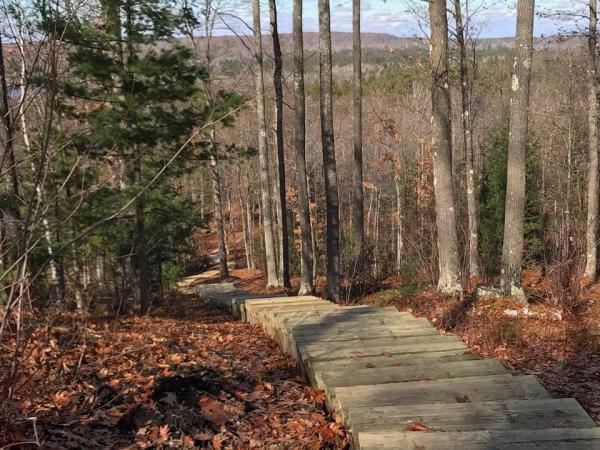 This trail can be used for hiking, picnicking, snowshoeing, photography and bird watching…etc. This walkway provides easier access to Keyes Peak’s newest disc golf course attraction. Anyone can climb to the top of the hill at one’s own pace – so if you are looking to get some fresh air and exercise, this is the perfect walkway for you! Picnic tables are available so you can enjoy a snack or nice lunch. The Florence High School sport teams plan to use this walkway as one of their training sites. Keyes Peak walkway system is accessible by vehicle with parking available on Overlook Road located off of Highway 101 or at the Keyes Peak Lodge. It can also be reached utilizing the ATV or snowmobile trail which is adjacent to the ski hill.